I went to the Royal College of Music from 1984 to 1988. I continued my studies there, with the teacher I had gained so much inspiration from two years study previously. David Mason had been there and forgotten more than most of us will ever know. He had played for everyone who was anyone; Richard Strauss and Stravinsky to name only two. He had been been Principal Trumpet everywhere in London and if he hadn’t, it was said that he had turned those positions down. As a warm up David would recommend a couple of pages of Charles Colin (no more) and page 125 of the Arban Cornet Method. As a keen young trumpeter I complied absolutely. I had mixed success but I thought if I kept at it I would achieve Nirvana, that strange mythical trumpet state no-one to date has ever achieved! I could hack the Charles Colin but I seemed to get worse and sore with p.125 of the Arban. Some students did and some didn’t but I tried sooooo hard. I imitated David as best as I could. He was always so neat and tidy and precise and I made every effort to copy. David could play more staccato, with no trouble and more success, than any trumpeter I’ve ever met. Doing the odd gig with him I used to marvel at his economy of effort. I have realised over many years that playing p.125 of the Arban staccato does me more harm than good if I copy David Mason and play the notes so short. He used to sound brilliant! For me if I peck at these notes I get a tightness that results in limited or negative results. I have discovered that for me the opposite is extremely beneficial. I play this study about once a week or two weeks. 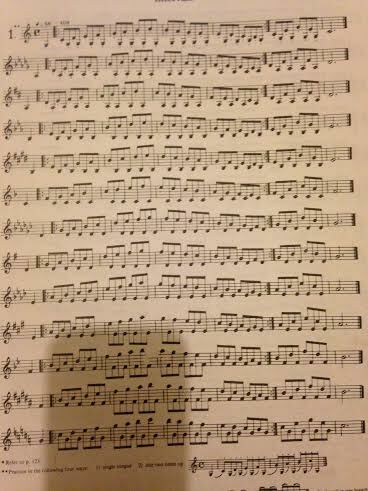 My ‘chops’ tell me that I need to do a bit of a stretch so I reach for the Yellow Pages (the Arban) and turn to p.125. I start in the middle, in F major, and work upwards through the keys. I then work down from around the same starting point. I don’t play these staccato, I do the opposite. I try to think of every line as being one long note, one long beautiful phrase. I take a wholesome, big breath at the start and despite thinking of the line, including repeat, as one long note, I breathe when I have to. I try to bear in mind that the scale is the tune and the dominant pedal (the repeated note) is the accompaniment. I try to make no gap whatsoever between the notes, so I cut the air stream as little as possible. I try to make each line of the study as musical as possible and less of a physical exercise. I also try to make the Attack/tongue action fairly swift to strike the notes and get out of the way. For me, all of a sudden, the wide intervals don’t seem so distant and my chops feel nourished rather than sore. I don’t worry about going fast either. I prefer to work on efficiency of technique so for more me, the slower the better. To be honest, I don’t use the music, preferring to rely on my brain. There is more benefit to be gained without writing everything out. Learn to play and transpose without wading through pages of the same exercise – it saves time in the long run! The same applies to the Herbert L. Clarke ‘Technical Studies’, in my view.